We welcome the newcomer to the family! 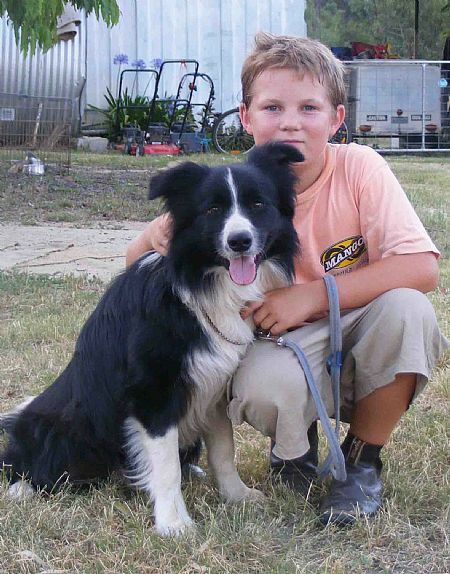 Robbie has been given a huge opportunity to own the breed of his dreams - A Border Collie!! A huge thank you to Sheree Aylett for making his dream come true! Kerrybrent Chasing Rumours (IMP NZ) "Chase"
This page is a work in progress, please check back soon for updated photos of Chase! HAVE BEEN VERY SLACK WITH THIS PAGE!! ​CHASE IS NOW AN OLD MAN AND STILL ENJOYING LIFE ON THE FARM. HE HAS BEEN JOINED BY A GORGEOUS YOUNG LADY CALLED RENEE! ​RENEE IS NOW THE PROUD MUM OF 3 LITTLE STUNNERS AND ROBBIE COULDN'T BE ANY PROUDER! ​DETAILS OF AVAILABLE PUPPIES IS ON OUR PUPPY PAGE. THESE LITTLE GUYS WILL BE READY TO GO TO NEW HOMES JUST BEFORE CHRISTMAS.